Last night Elliott continued to suffer from being sick. It's been a slow, lingering sickness that's been around since early last week, presumably caught from me. Yesterday he developed a slight fever so we took it easy in the evening. 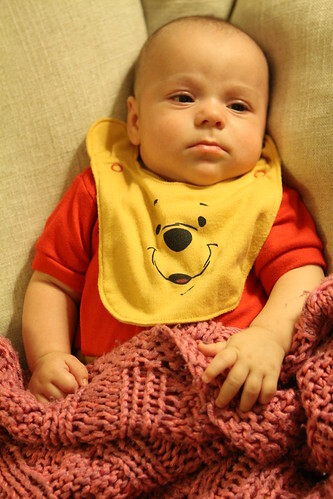 This was the third or fourth day we had attempted to schedule Halloween so we decided on having a very low key, half-assed Halloween where we dressed Elliott up as Winnie the Pooh and he sort of just lied there, quietly humoring us. Martin was a little more excited by his costume though it was so warm we could only leave him in it for a few minutes at a time. It would have been great had we taken them out trick or treating on one of the two storm-canceled nights. Sadly our area just gave up on the event in fears that we couldn't pull it off before Christmas. Now we can't take the guys around and show off one of the half dozen costumes we have for them this year. Even sadder, we can't eat all of their candy. 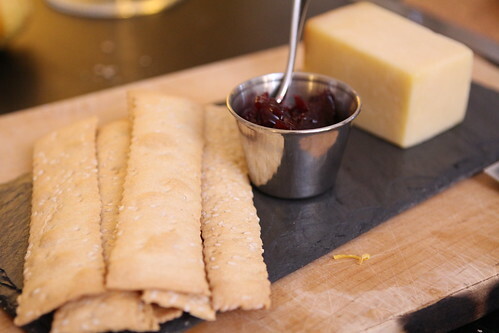 For dinner I put out this delicious Cabot Clothbound Cheddar along with some nice crackers and a cranberry bacon chutney from Anarchy in a Jar. 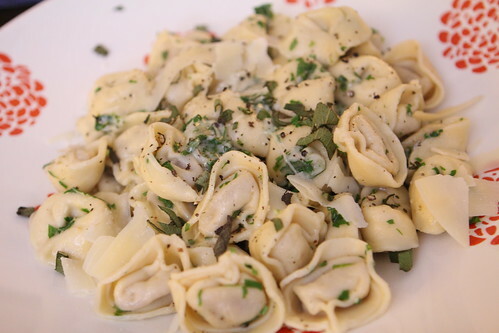 For the main course I cooked up some pumpkin tortellini which I tossed in butter, parsley, sage, and shaved Parmigiano-Reggiano. We've pretty much eaten every meal with the guys in their rockers right by the table. This is for the simple fact that no matter how tired they are there is nothing that will stop them from fussing while we eat. That ten minute stretch of time every night never goes uninterrupted. The doctor said it's okay to start introducing solid foods if they show interest. 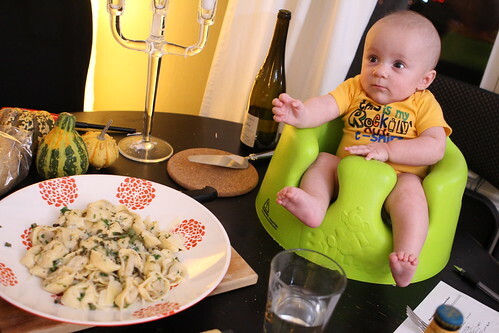 While Elliott rested we put Martin on the table in his Bumbo to see if he was interested. He was definitely very interested to watch this whole ritual from a new vantage point but it was unclear if he was interested in the food itself. However, he did enjoy licking one of the fingers I was eating short ribs with the previous night. In fact he licked it for the better part of fifteen minutes to the point that my skin was wrinkled and he would get cranky if I pulled it away. Is short ribs a good first food for babies? I guess I'll need to do some research to find out for sure. After dinner we were able to get the guys into another of their costumes and we dressed up as Run DMC. This only lasted a few minutes as it was pretty warm in the apartment and Adidas track suits are not particularly breathable. 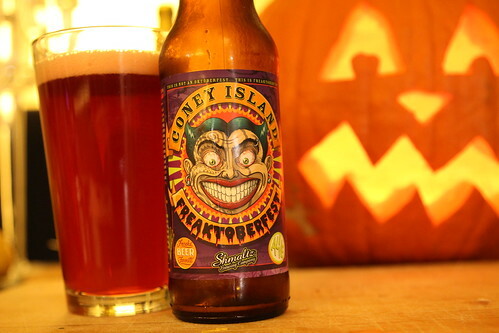 After dinner we also carved a pumpkin and had this Coney Island Freaktoberfest beer from Shmaltz Brewing. This was an odd beer, purple in color, that I expected to taste like a sweet grape soda. Instead it tasted quite beer-like with a slightly chalky finish. It was a week-and-a-half late and we didn't get the opportunity to take the day to dress the guys up in all their costumes. Thankfully these guys don't have any clue what Halloween is or even any concept that they are being dressed in anything more ridiculous than their normal outfits. It's good practice for Christmas when their family will descend upon them, throw off their routine, and give them a ton of gifts they don't want or need. Ah, the holidays. It truly is the most wonderful time of the year!